Toronto: The Canadian Centennial Library, 1965. Hardcover. Good. ed. Pierre Berton, Remember Yesterday - A Century of Photographs, Toronto, The Canadian Centennial Library, 1965. Pictorial cloth covers with red spine, 4to (28 cm), 128pp. 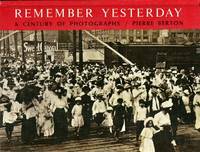 Photographs, mostly bw, from daguerrotypes and wagon trains to the "nuclear age." Good: corners bumped, smudge on ffep, no po markings. McClelland & Stewart, Toronto, 1965. Hardcover. Near Fine / no dustjacket. 128 pages, 9" x 11", illustrated throughout, illustrated boards, ownership inscription on ffep, otherwise clean and tight. Canadian Centennial Pub. Co. Hardcover. B0007J11R0 STATED FIRST EDITION, IMPLICIT FIRST 1967 PRINTING. DJ IN GOOD CONDITION WITH MINOR FLAWS AND NO STICKERS OR SUN FADING. END PIECES ARE CLEAN. COVER BENEATH DJ HAS BEEN PROTECTED AND IS EXCELLENT RED DESIGN WITH SQUARE CORNERS UNWORN.. INTERIOR HAS FRESH BUT SLIGHT AGE-TONED PAGES, WITH NO NAMES OR MARKS. NOT EX-LIBRARY. NOT REMAINDER MARKED. VERY DECENT COPY OF A RARE TEXT. SEE PHOTOS IF AVAILABLE. 6270 HIST16-105 01. . Very Good. Canadian Centennial Pub. Co. Used - Good. Good condition. Good dust jacket. Slightly dampstained. Canadian Centennial Pub. Co. Used - Good. Shows some signs of wear, and may have some markings on the inside. Canada: The Canadian Centennial Publishing Co.. Red boards with blindstamped pattern design, gold lettering and cover design. Bright and strong copy with slight shelf-rubbing at the corners. . Very Good. Hardcover. 1965. Canadian Centennial Pub. Co. Good. 1965. Hardcover. A Good Read ships from Toronto and Niagara Falls, NY - customers outside of North America please allow two to three weeks for delivery. Minor rubbing to edges of cover and spine. ; The Canadian centennial library; 11 X 8.75 X 0.74 inches; 127 pages . Canadian Centennial Pub., 1965. Hardcover. Good. Hardcover. Sound & good copy, light to moderate rubbing/edgewear to boards, mild bumping at corners.